Sometimes being a homeowner feels like such a roller coaster ride. Whee! There are times I look around and swell with pride over how much Chris and I have learned and accomplished by owning a home. Other times it’s quite frustrating like when something breaks or looks ugly and you’re the one responsible for either figuring out the repairs or phoning it in for help. Apartment living meant that we could call the maintenance team for just about anything, we never had to worry about major purchases, and it also alleviated my own stresses of minor things like paint color selection because we weren’t allowed to paint. But I wouldn’t go back to renting – I love our house, and being the control freak that I am, I appreciate having as much input as I can on how our home looks. On that note, we aren’t allowed a lot of leeway when it comes to the outside appearance of our little townhouse. The exterior paint colors and fixtures are all HOA-selected, and we aren’t allowed to make many changes. 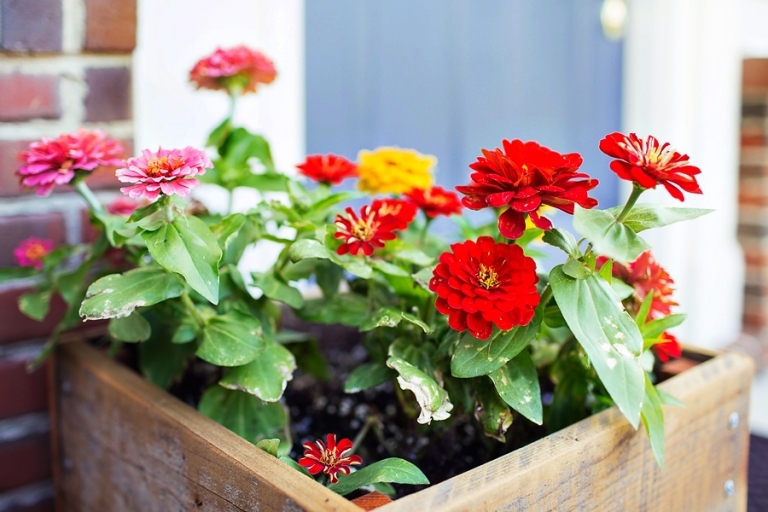 Things were looking kind of blah from the curb, so last week I added a cute reclaimed wood planter on our tiny stoop with zinnias for a splash of color. 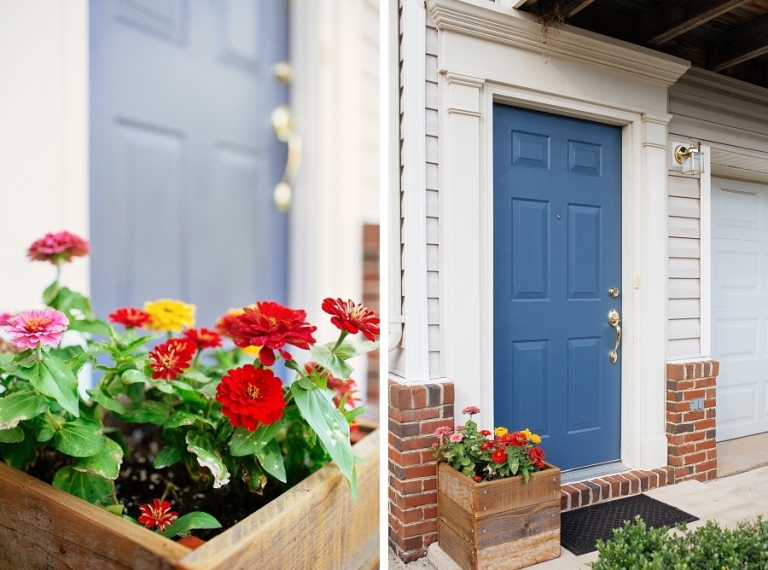 The planter looked great, but then it made me notice the awful condition of our front door! Not to mention our handle decided to break and we couldn’t open the door from the outside, so I figured while I had the handle off I might as well paint. I wish I had a better before picture of the door for you, but once I decided to remedy the old, faded paint job, I got to work right away and forgot to take a photo! 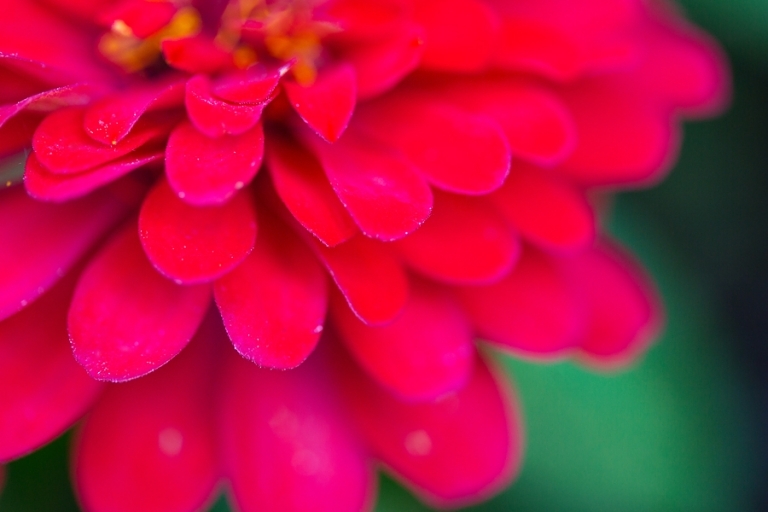 I only have this close-up from when we bought the house. I cleaned the surface to see if I could get those drippy marks off, but it didn’t look any better. 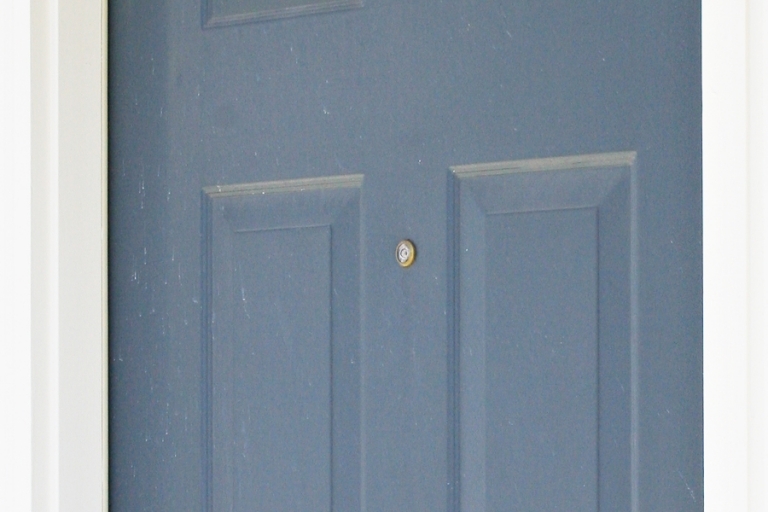 We also changed our deadbolt a few years ago and it was a different shape than the original, so there was a bare patch with no paint above and below the new deadbolt. And, someone recently put some kind of dumb sticky flyer on our door and when we took it off, the adhesive ripped away a strip of paint, so there was that eyesore, too. Painting always feels like a lot of work to me, but it’s such a small commitment in price and time for a huge return. I can’t even believe the difference it made, and I feel so happy to walk up to the front door now! The only problem now is that the freshly painted door made me notice how badly the door trim needs a new coat of paint, too. There’s always something!